This little chap is running slightly too late to be put on the Christmas tree so he has had to make do with decorating our friendly yucca house plant. Yes I'm still working on Christmas decorations even though it is mid February! If I had been slightly more with it I would have done something crafty for valentines - but that will probably have to wait until at least July now..! There is a reason why I choose to make scottie dog Christmas decorations though - it all started months ago when I decided to make up the lovely poinsettia pattern that is freely available from PlanetJune's blog. When asked by my husband mid through working on this poinsettia what I was making he seemed surprised and said that he always thought that was a dog. 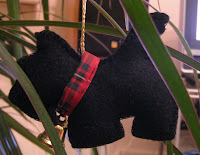 After that I had to make him a dog decoration - and the most Christmasy dog that I could think up were these cute little scotties. Now to get that poinsettia finally finished!